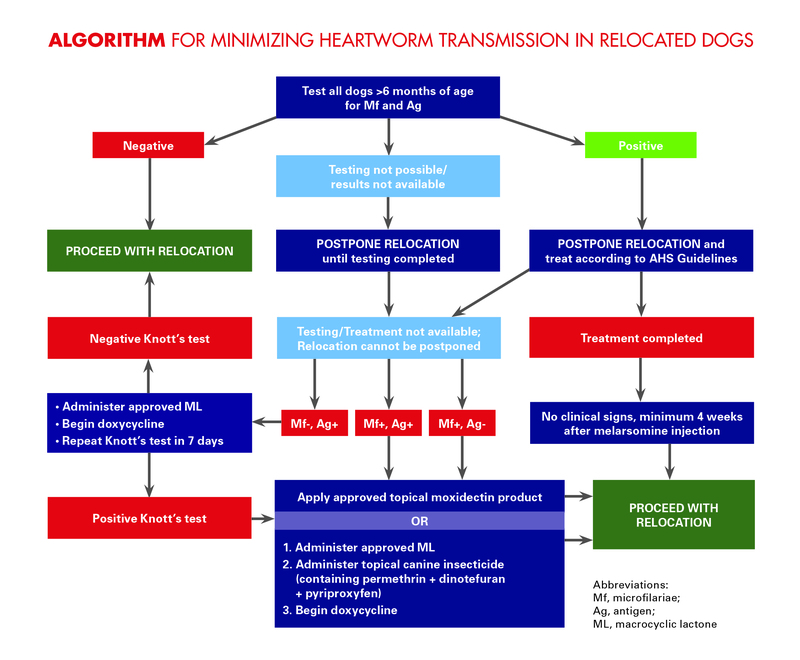 become an unintended consequence of these and other travel plans, the American Heartworm Society (AHS) has announced a new set of veterinary best practices for minimizing heartworm transmission in relocated dogs. The guidelines include recommendations for heartworm testing, treatment and prevention, and were developed in collaboration with the Association of Shelter Veterinarians (ASV). Fortunately, measures can be taken to protect the health of both infected animals and their new neighbors, says Dr. Rehm. While the ideal scenario is to treat infected dogs before transporting or traveling with them, situations often dictate that infected animals cannot undergo a full course of heartworm treatment, including adulticide administration, before hitting the road. The goals of the AHS Transportation Guidelines are three-fold: (1) prevent infected dogs from becoming heartworm reservoirs; (2) ensure that untimely travel does not trigger heartworm disease complications; and (3) assure that, once treated, dogs are on lifelong heartworm prevention. “It is clear that care, cooperation and communication are needed on both ends of any journey that involves a heartworm-positive dog,” Dr. Rehm concludes. “Our goal is to help veterinarians who oversee the health of both traveling and adopted dogs—as well as their clients—understand the threat and make the prevention of heartworm transmission a priority. Visit https://www.heartwormsociety.org/ for more information.